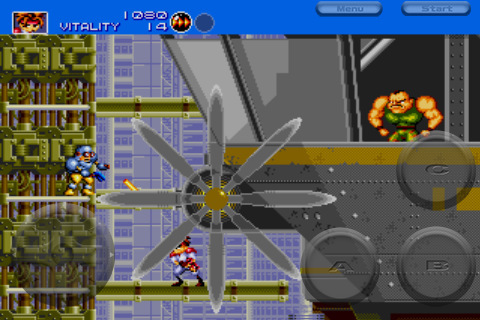 Gunstar Heroes is a side scrolling shooter app, adapted by SEGA into an application for the iPhone, iPad and iPod touch by Sega America for only $.99. And overall, I’d say that it’s a good purchase, though it’s definitely not without its issues. The controls themselves are not entirely bad, though the buttons that you’re meant to push tend to get in your way more often than not. Because of this, it makes it very difficult to actually see what your character is doing from time to time, which can be highly detrimental in an app that has such a constant and heavy onslaught of enemies. However, this problem can easily be solved with an option that most games adapted into iPhone apps do not have: the ability to shrink your screen so that the controls are outside the app’s window. To get this you simply need to click “menu” and then “switch view.” I found that this made it much easier to play, though your fingers will still slip off of the buttons on occasion. The graphics, I find, are pretty good for this application . While they’re nothing too flashy, they’re also certainly not ugly. The boss battles in particular stand out as rather visually appealing, though the rest of the game stays pretty stagnant in its use of graphics. While there doesn’t appear to be much to the story, I found that to actually be quite helpful with this iPhone app . Very few people are going to care much about an in depth story line when it comes to a quick app they’re playing on their iPad or iPod touch . One of the greatest treats inside Gunstar Heroes is the ability to customize your gun. Throughout the story you’re able to create various weapon combinations by using small power orbs, which can enhance the way that your gun is used. At points I found myself stuck in a “smash or die” scenario, in which I left with no other choice but to randomly press buttons and hope that I’d survive. As with most people, I hate being put in “smash or die” positions, because situations like that really strip away any level of skill that would normally be required. However, the ability to shoot in all directions prevented those situations from coming about too often, ultimately fixing a huge problem that arrises in most side scrolling shooters. Overall, Gunstar Heroes was a pretty good experience for me. It does a fairly good job of keeping itself fresh without losing its authenticity. While there are definite places in which it can improve, I think it’s a great time-passer and is a good addition to anyone’s app collection. 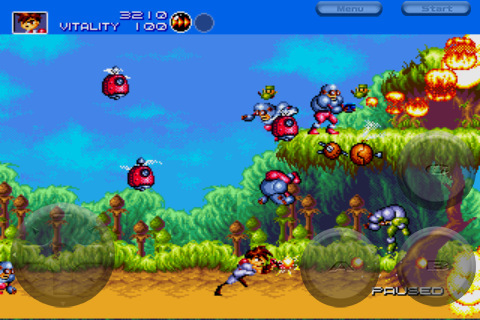 AppSafari review of Gunstar Heroes was written by Darius Reimm on October 28th, 2011 and categorized under Action, App Store, Arcade, Fun, Games, Scrolling Shooter. Page viewed 4286 times, 2 so far today. Need help on using these apps? Please read the Help Page.